Jump down to: The Three-Tiered Jennings Box --- The Irwin Box I --- The Irwin Box II --- Stanley No.59 Doweling Jig Box --- What's Coming Next?!?! Once you have invested good money in a set of bits, you should think about a way to protect them. Traditional solutions offered by drill companies was drill rolls and boxes. Interested in a roll? Check out our drop site titled DRILL ROLLS. We have taken five commercial rolls made by the companies, laid them out and included dimensions and detailed information. A number of people have used this drop to make an effective and inexpensive way to store bits. BOXES: We have purchased dilapidated old boxes and used them to reverse engineer and build updated versions of these old favorites. We examined each box, not only to see how they were made, but to figure out how time and usage affected them. We then went on to put together a better product. Primary material for these boxes is Douglas fir that was harvested from our property, then seasoned for five years. Some of this wood has also been recycled, so there may be filled nail holes…. just to give them a little character! The rough lumber is then resawn and glued, so it is straight grained. This not only makes the wood more stable but offers up a beautiful contrasting grain. Much of the hardware on the old boxes was proprietary and just does not exist anymore, so we have had to find alternatives. For hinges and clasps, we use brass, but instead of the nails most often used, we mount the hardware with screws. We had to replace the metal Grip Clips with a nylon version, but this allows us to custom configure our boxes; something that could not be done on the older versions. We cast around for some time trying to find a nice color for our lining and finally settled on the maroon you can see on our newer offerings. That eye watering shade of yellow on the older boxes is gone! We use our own labels. These are not meant to be copies, but “Grandpa boxes”! The hinge on the old versions of this box was never available to the public. We decided to go with barrel hinges. They have a clean look and work well. Secondary wood in these boxes has been Ponderosa pine but will be blue spalted white pine. 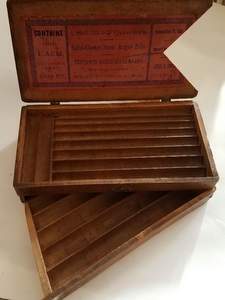 There were several types of this basic box, using the same shell. This was accomplished by using several combinations of Grip Clips. We can reconfigure our Grip Clips to customize your box as well. Just let us know what you want. Secondary wood is 1/8 in. luan. We came across a couple specimens of this box, which is a scaled down version Irwin I box. 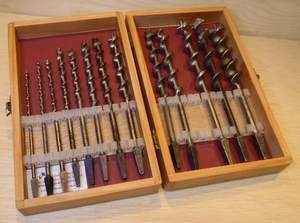 A lot of Hand Tool School apprentices order six piece “BB” sets of bits. This is the box that original set came in. This box can also be custom fitted but is a bit restricted due to the smaller sized. Secondary wood is 1/8 in luan. 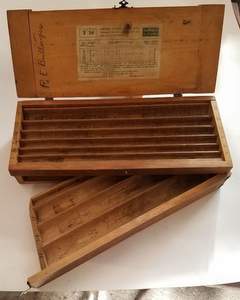 Stanley Tools never made a wooden version of this box but used several versions of their cardboard containers while this jig was offered. We stopped making these for a while but were surprised to find that there is a demand for them, so we are offering them again. Pictured below is an older version of this box. The newer version is presently under production. Dimensions will be slightly different but will look very similar to the older one. Regular hinges, rather than barrel hinges will be used. Primary wood will be Douglas fir, while secondary wood will be blue spalted white pine. We are about to introduce two new “swing out” style boxes. Here again, these are based on original models that were offered by the Irwin Bit Company. These old boxes are often extensively repaired due to some design deficiencies. We think we have overcome these problems and have purchased some special tooling to accomplish this. 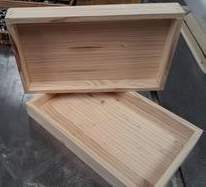 Like the other “Grandpa’s boxes”, these will be made from Douglas fir with blue spalted white pine for secondary wood. Hardware will be brass, mounted with screws. Prices are pending but will probably be along the line of the Three-Tiered Box.